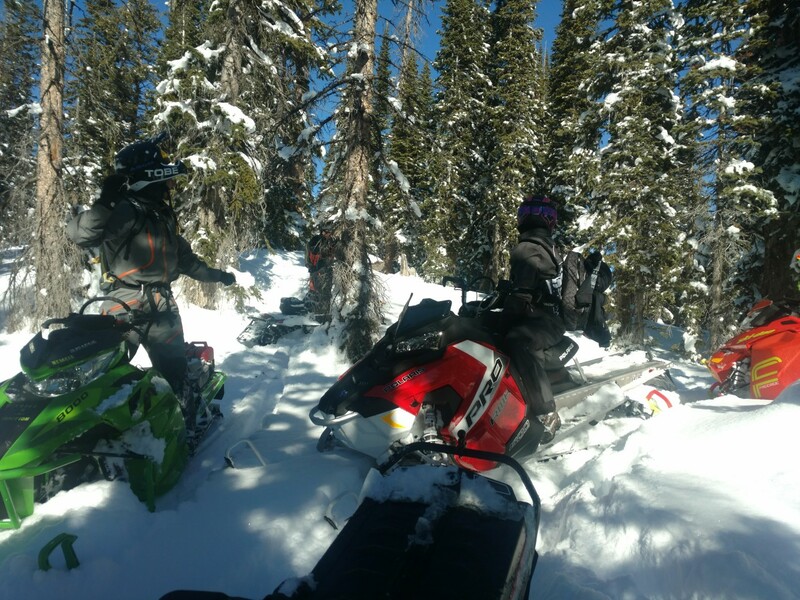 We had a group of 7 ride out of greenrock today and what we found made it seem like late December conditions! Coverage from the parking lot in greenrock was excellent for November. There was several feet of snow on the side of the road and fairly good coverage on highway 130 all the way to the junction with N. Even Libby flats had fairly good coverage. 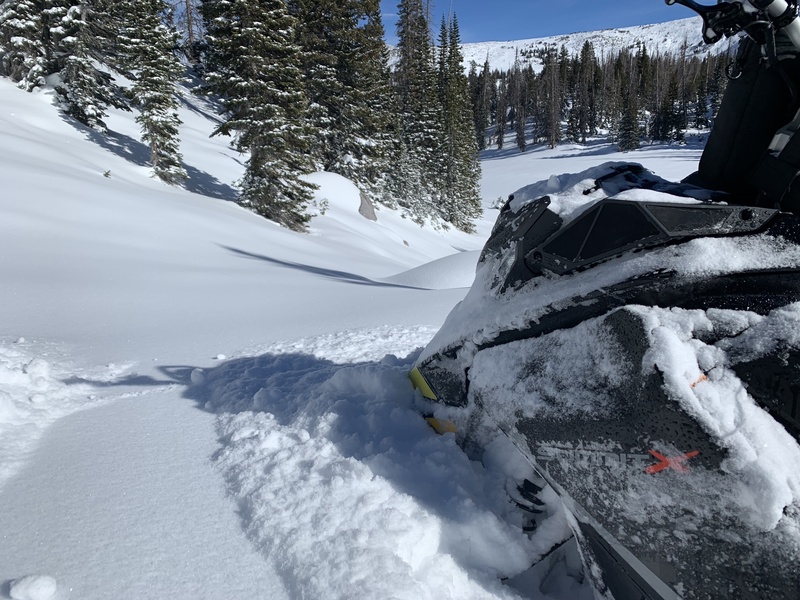 Near the junction of N and HW130 we found 2-3 feet of new snow with a surprisingly good base underneath for November. Still plenty of landmines buried and partially buried, but again, for November very good coverage. 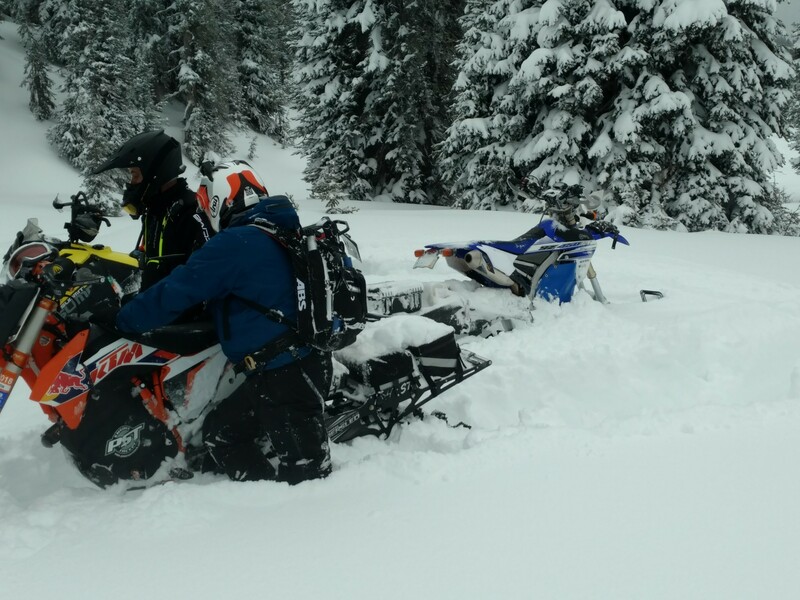 We continued north on N and found plenty of deep snow to play in. 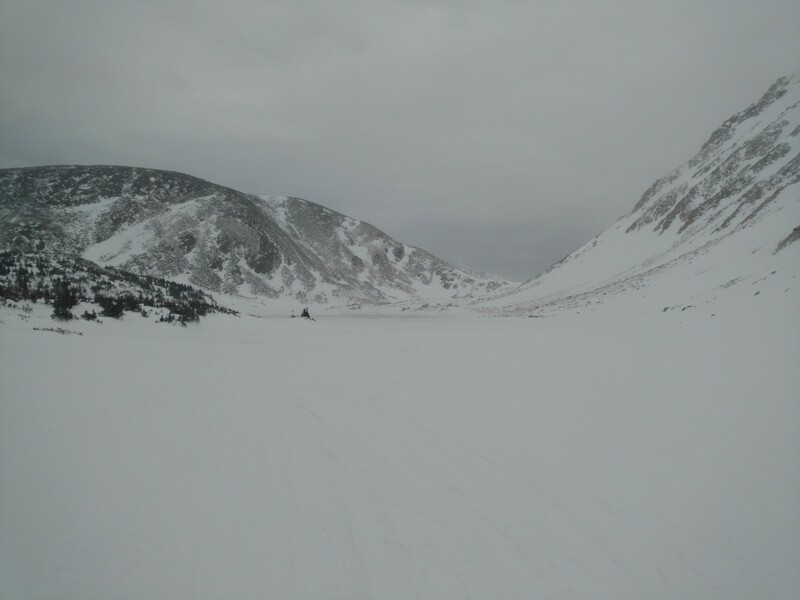 Lakes were mostly frozen but we still avoided them as much as possible. Streams were very well covered for this time of year but there were still plenty of holes to be found. Hillsides had fairly good coverage. We found a few spots with good coverage that we could do some mild climbing without to much worry of rocks but for the most part tree riding and climbing should be avoid until the base builds more. Stick to the meadows for now. 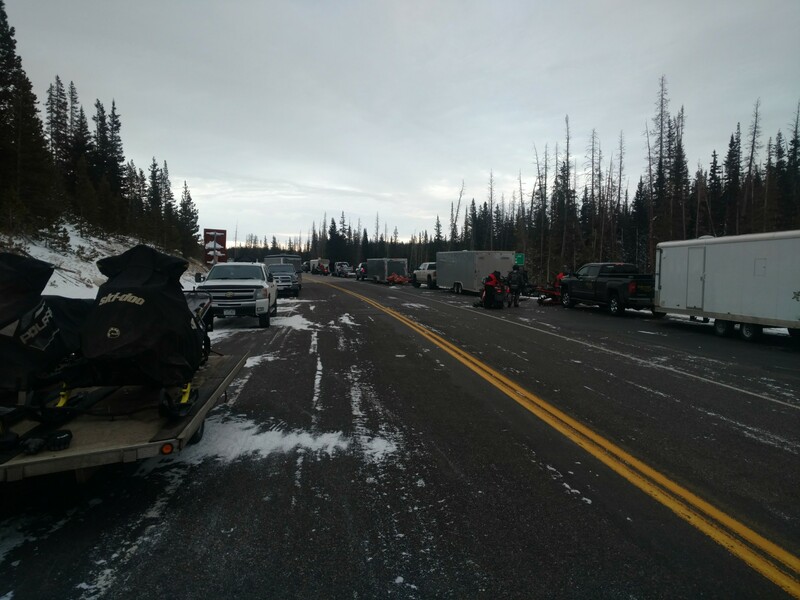 The base will likely settle early this week and the highway will likely start to be patching if you are looking to ride before thanksgiving. Hopefully the system moving in late this week will pan out. This will likely set up Colorado and Wyoming with a good base to kick off the season. 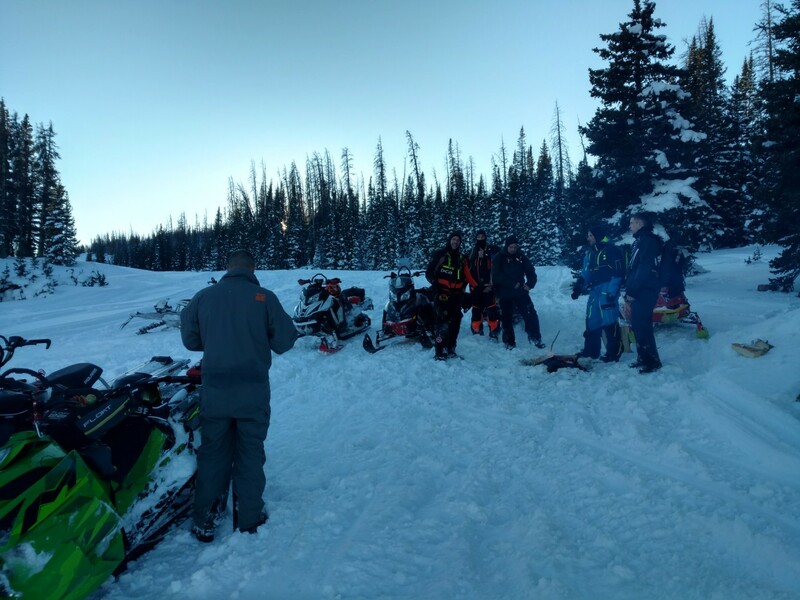 The Colorado Blizzards are very excited to announce that one of our families will be receiving Colorado Snowmobile Association Snowmobile Family of the Year! Thank you Rexford’s for everything you do for our sport and for being such genuinely great people! 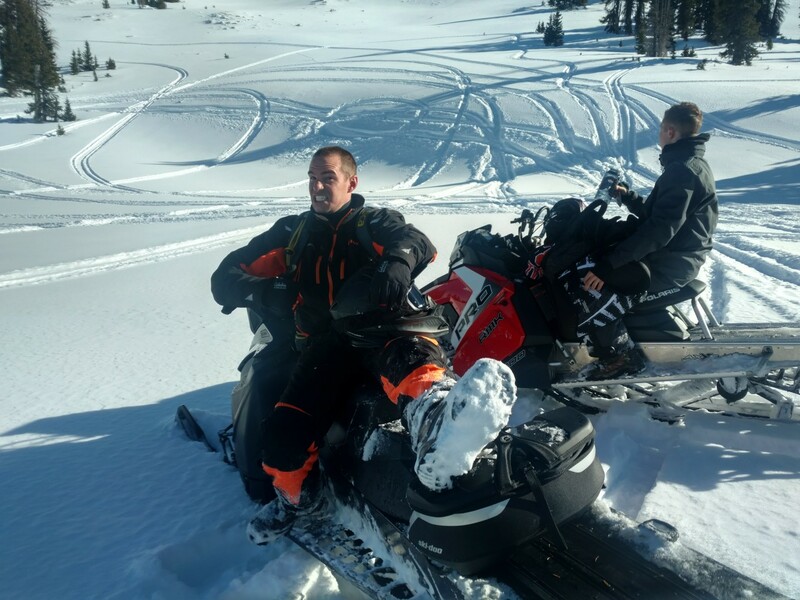 We also want to congratulate Brandon Tudizzle Cox for receiving Snowmobiler of the Year! Thank you Brandon for everything you do. 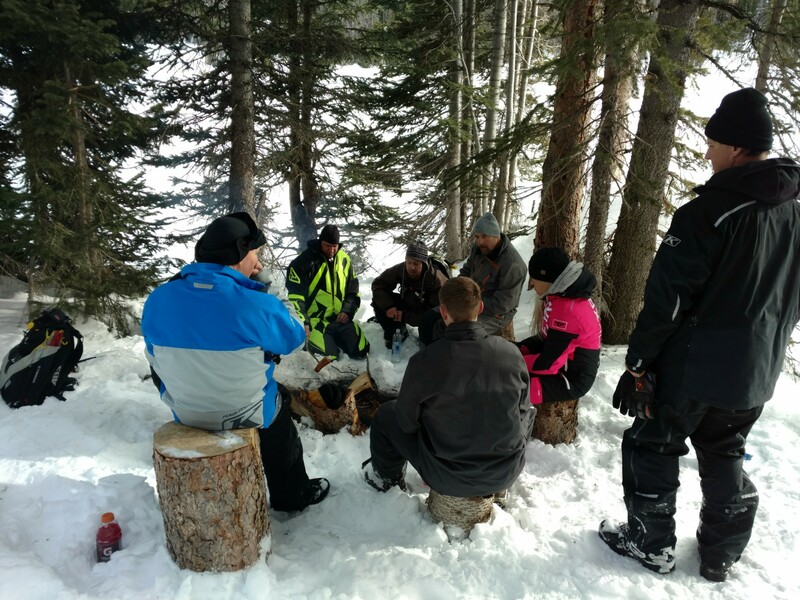 Your efforts to promote our sport are second to none and we need more people like you involved in the snowmobile community! 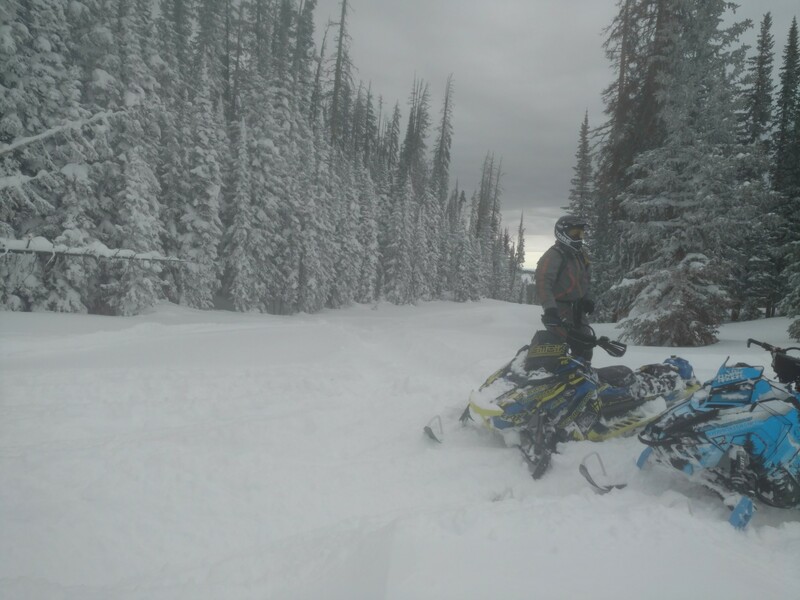 Needless to say, the last storm drastically improved the conditions in the snowies! 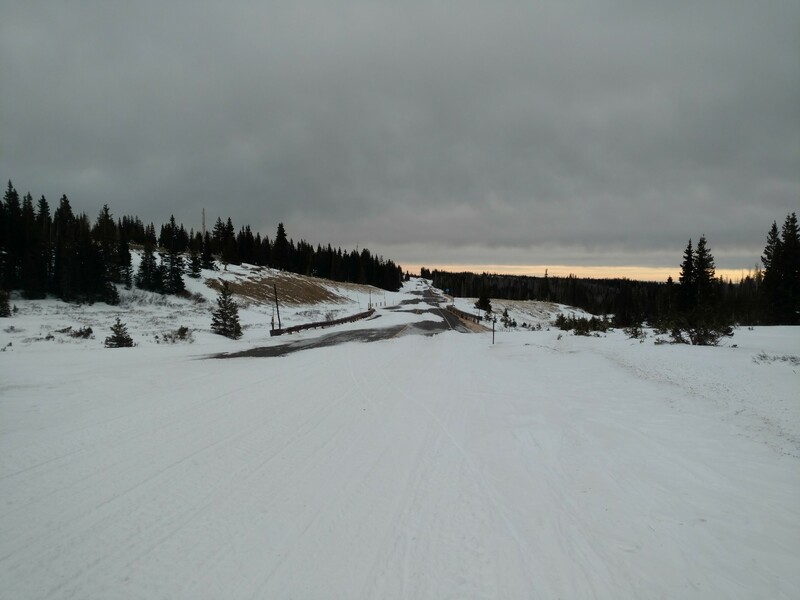 Grooming out of Greenrock has not started yet but there is plenty of snow on the shoulder up until the road closure sign so grooming should start soon. The road is mostly covered with some dry patches where there is a lot of wind. 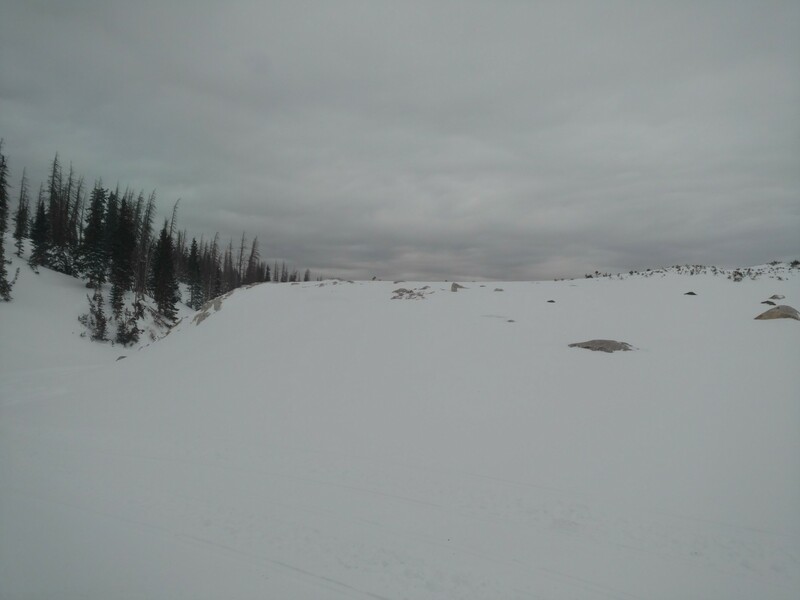 These areas will likely not have snow on them until grooming begins and packs a base down. 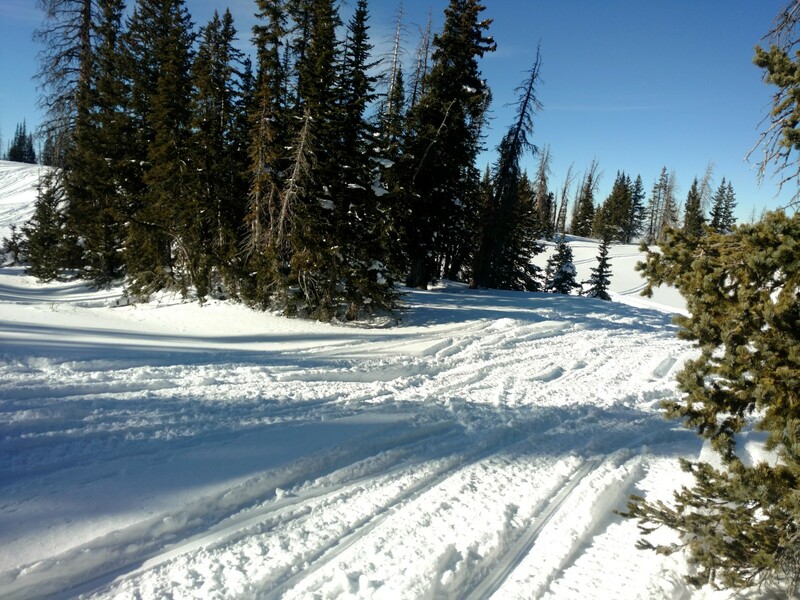 The road is ridable at regular speeds up and over Libby flats but there are a couple dry spots on Libby flats until grooming stats. The east face still needs a bit more snow but with some careful navigation avoiding thin spots, the east face is ridable off trail. 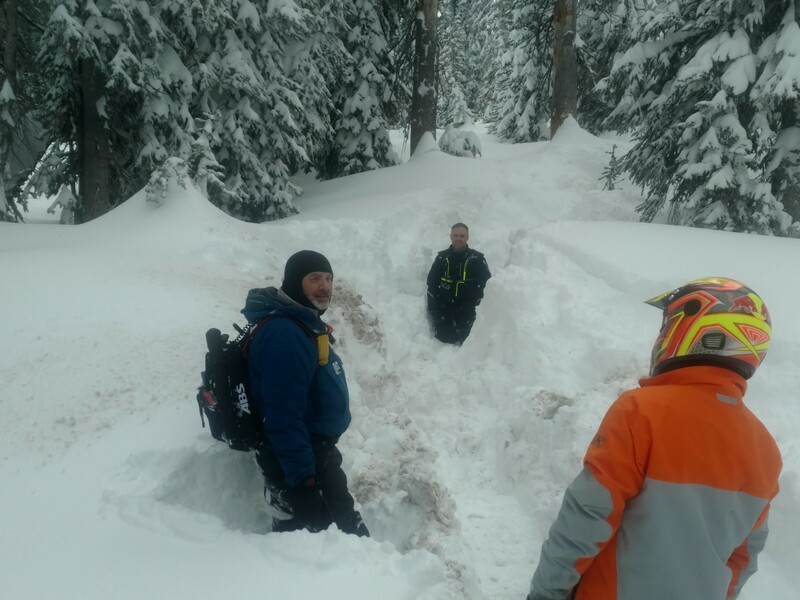 We continued over Libby flats where the snow started to get extremely deep around lake Marie. Lake Marie hill was climbable but it was difficult to say the least. 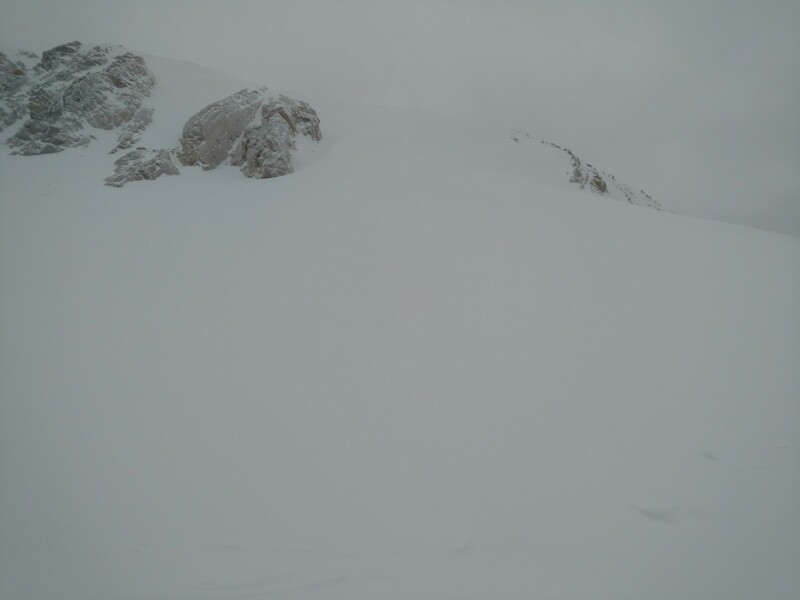 We played in this area but the snow was so deep that climbing any sort of hill was extremely difficult even for the turbos in the group. We continued down 130 to the intersection with N and proceed south off highway 130 towards the Nelson Waterfall area. 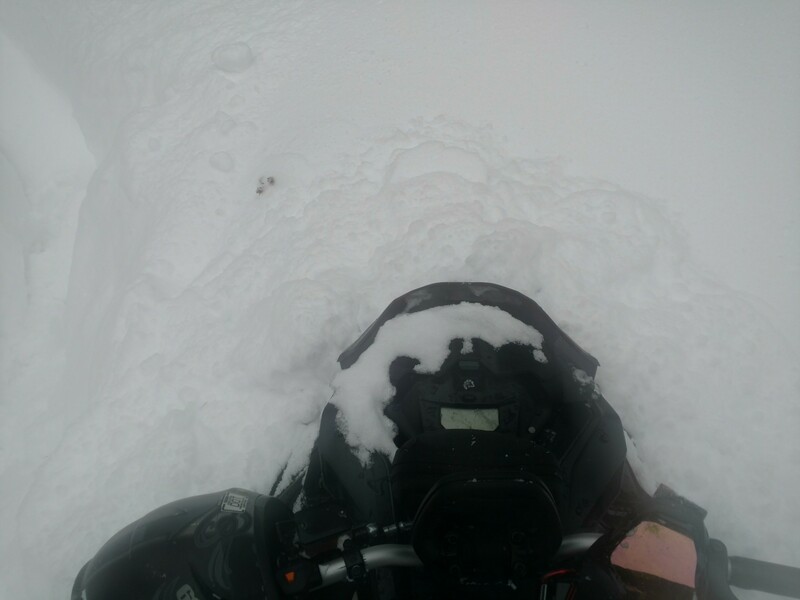 This area had some amazing snow but once again, extremely deep. To climb the trees just south of the highway 130 / N intersection took constant full throttle to stay moving. There were times we were running full throttle through the trees for multiple minutes to keep moving. The waterfall was untouched but the snow was way too deep to climb it. We decided to boondock North towards the Quealy hut and continued to find epically deep untracked snow. We took a quick break at Quealy then we headed southeast from Quealy and played in the meadows and trees which continued to be great conditions. Around 3pm, we started to head west on NO towards widow maker with the intent of going through the gap. Widow maker is starting to fill in well and is climbable (if you choose) and the rollercoaster is 95% filled in and ridable. The gap is crossable but be careful to follow the track with good snow. 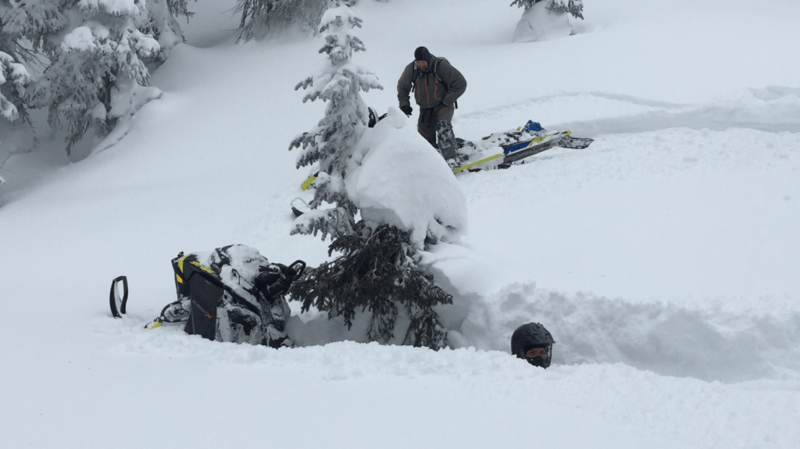 In summary – The snowies are open for riding! All lakes are frozen solid, blow holes are minimal and landmines are beginning to diminish. We did hit a couple minor things but for the most part, coverage and base is good for this time of year. If you haven’t been out yet this year, now is the time to start! 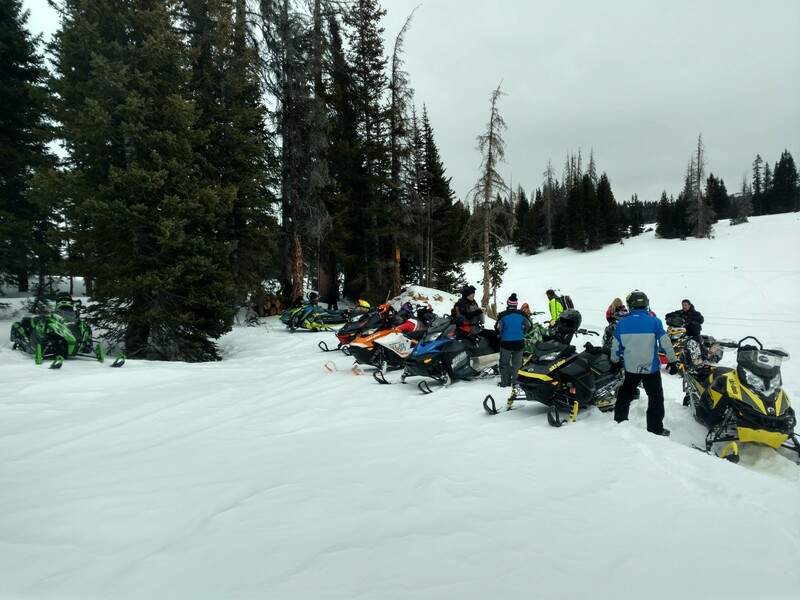 We rode out of Dumont parking lot on rabbit ears today with 2 sleds and 2 snow bikes. When we arrived, the parking lot was not plowed yet but the frontend loader showed up shortly after we arrived. From the parking lot, we headed north with the intent of going to the Tower on Buff Pass. When we departed it looked like the trail had been groomed within the last week or so but there were not trail markers out yet. 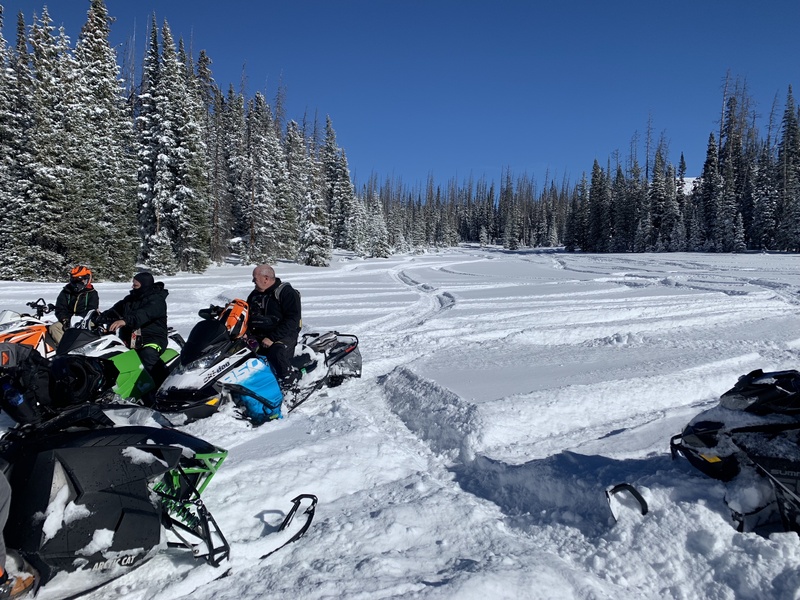 Although the trail was groomed recently, the new snow had blown in the trail so it was somewhat difficult to follow without the markers but still possible. 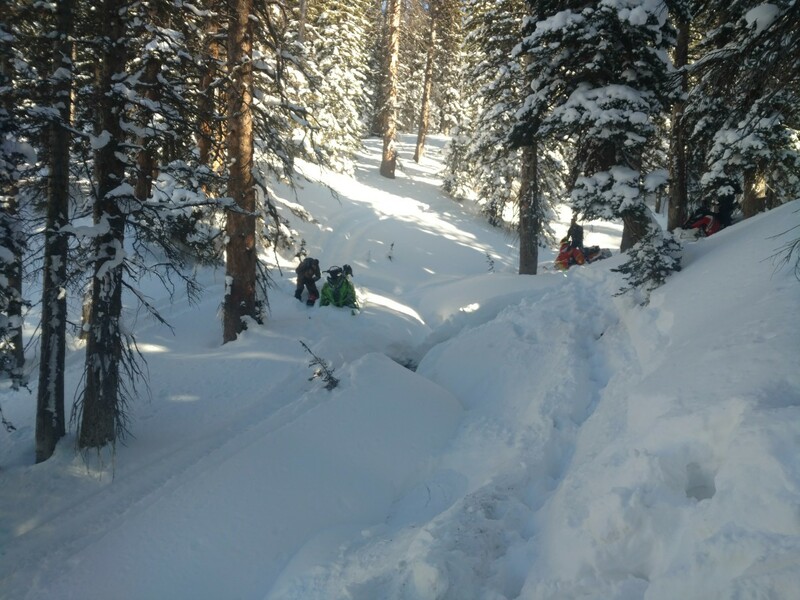 This storm seemed to have been very wind driven so a common theme throughout the day was 12” to 18” in the meadows then epic snow 48”+ deep in the trees. From the parking lot, the new snow was deep but it was clear there wasn’t much of a base. 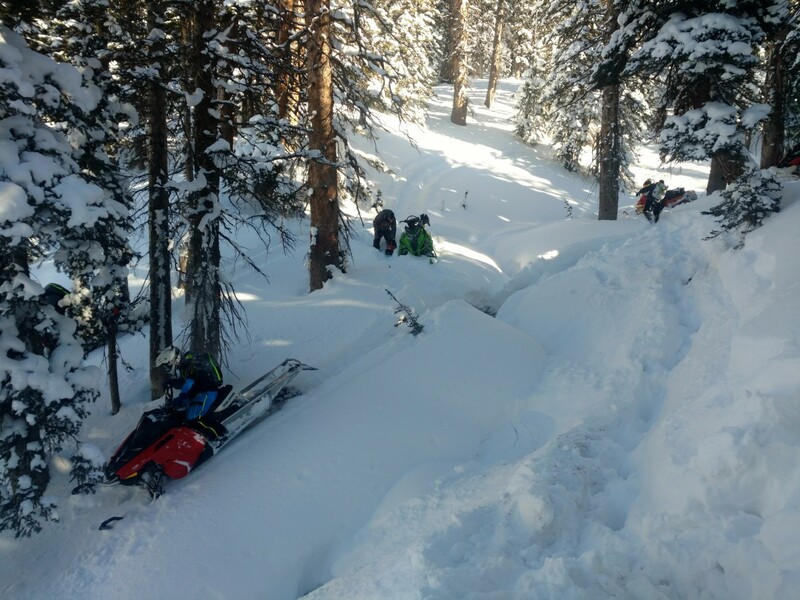 The base didn’t start to get deep enough to trust until we got through the “twisty’s” in the trail. After this point we cut off trail and found great conditions. Meadow hoping and climbing what hills we could was a great time. Fuel consumption was high today with how deep the snow was, I burned about ½ tank in 30 miles. 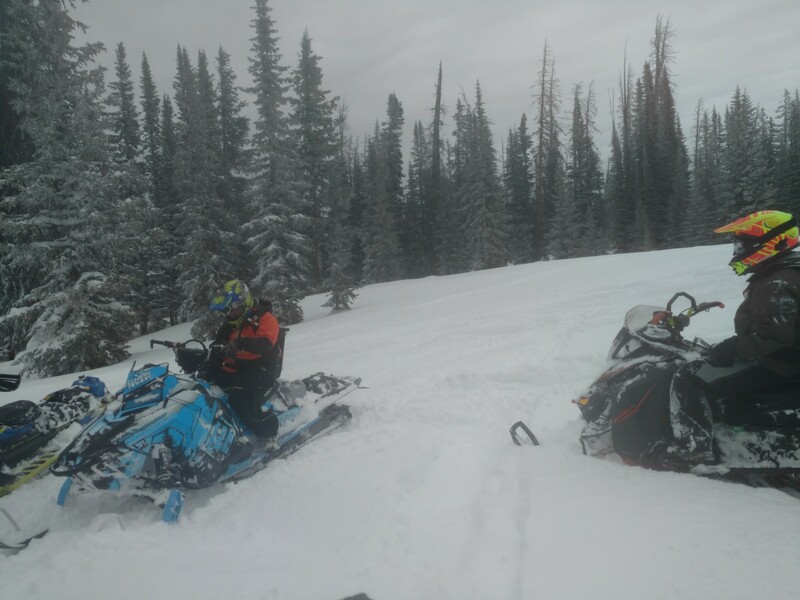 We cut into the trees which was great riding in epically deep conditions but quickly found out it was difficult to stop and get started again, even in the flats. 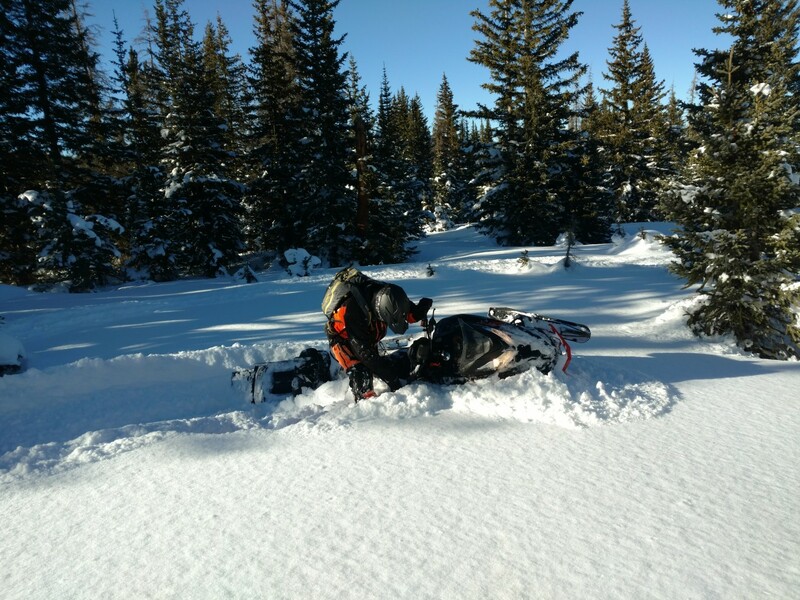 The snow had no bottom, so when we would start to get stuck, the sled would dig down 4 to 5 feet. The “pin & wiggle” proved ineffective today. 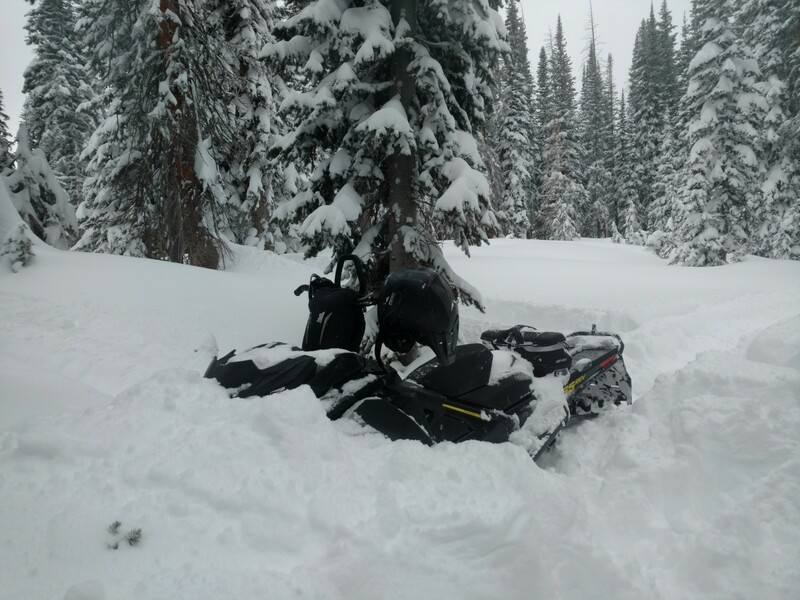 After to many stucks to count, we decided to keep to the edges of the meadows near the trees as the snow was very deep, but not so deep we risked constantly getting stuck. At about this point, we decided to abandon heading to the tower and just ride where we were. 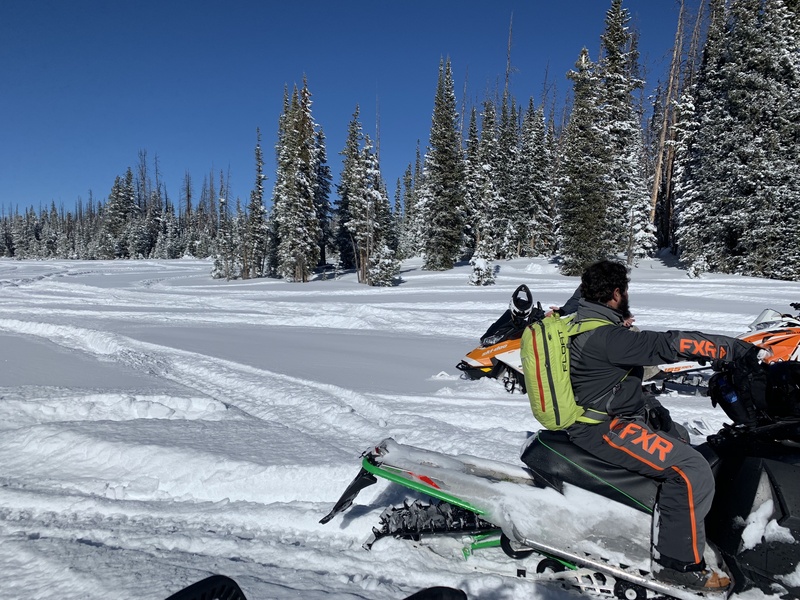 In summary – after this last storm, Rabbit Ears has good riding conditions. Still the occasional open blow holes, lakes were mostly frozen. I suggest staying North of the “twistys” and being careful in the trees until this new snow settles into more of a consistent base. Conditions are still thinner than the snowy’s but very much rideable. After this storm settles and another good storm rolls through, Rabbit Ears will be fully open. 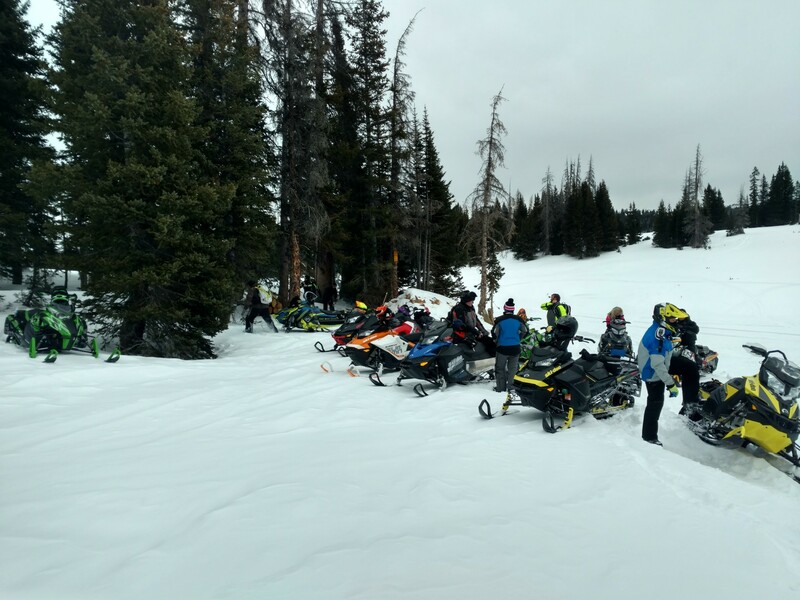 We had our first club ride of the season this last Saturday 12/16/17 with 13 members in attendance! We road out of Greenrock leaving the trailhead at about 9am and proceeded to the west face Quealy area. The east face is still very thin and still many dry spots on highway 130. 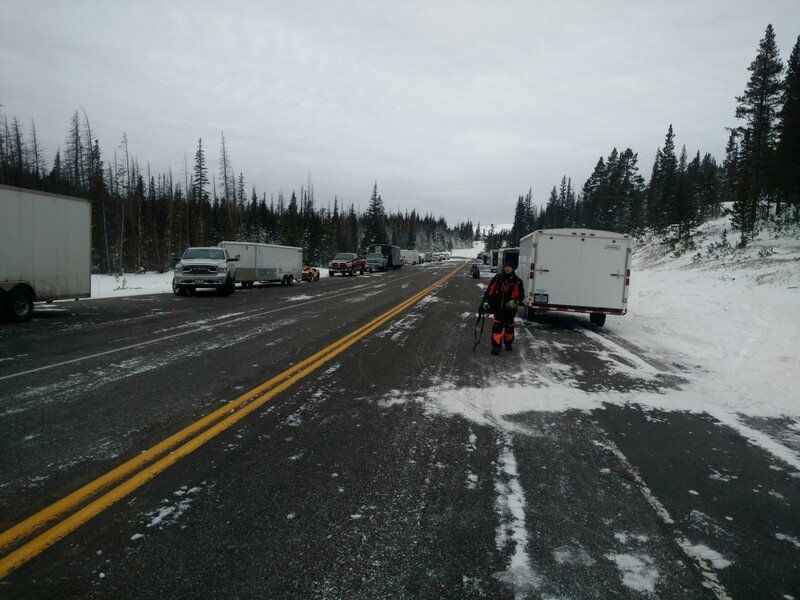 Once we got to Libby flats the road was fully covered all the way to the junction of N.
N is marked and groomed and looking great! 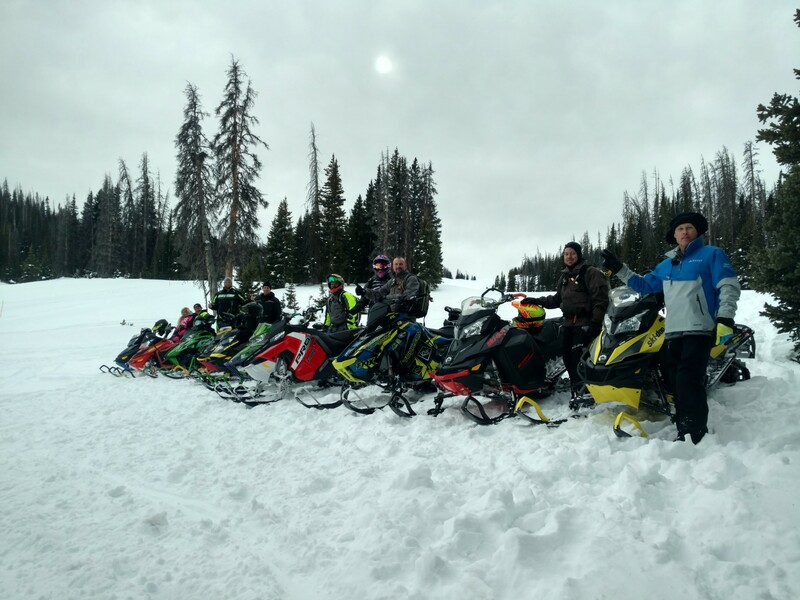 Thanks to The Snowy Range Snowmobile Club! 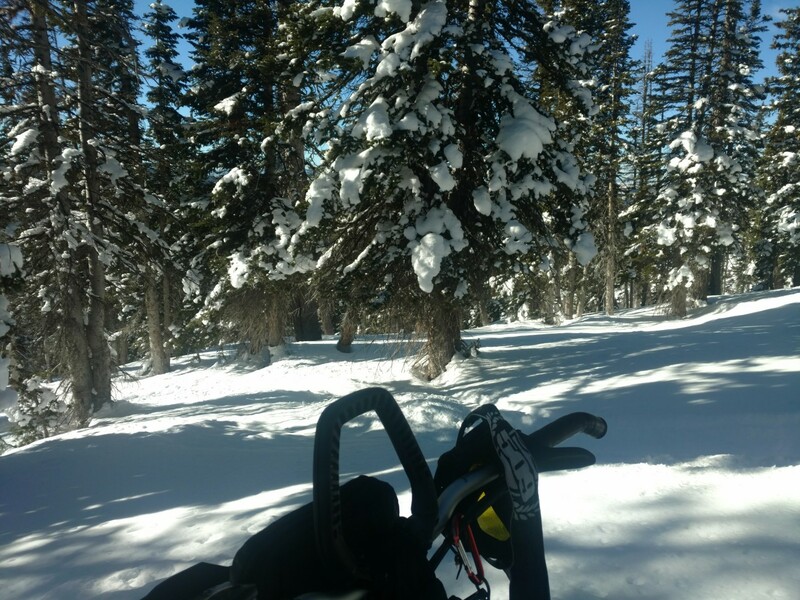 We broke off into two groups and rode south east of Quealy where we found good snow in the tree but still very thin. The small storm that moved through mid last week was not as generous as we had hoped. We met back up at Quealy for lunch then headed out south west of Quealy where we found some great creek bottoms to get stuck in! 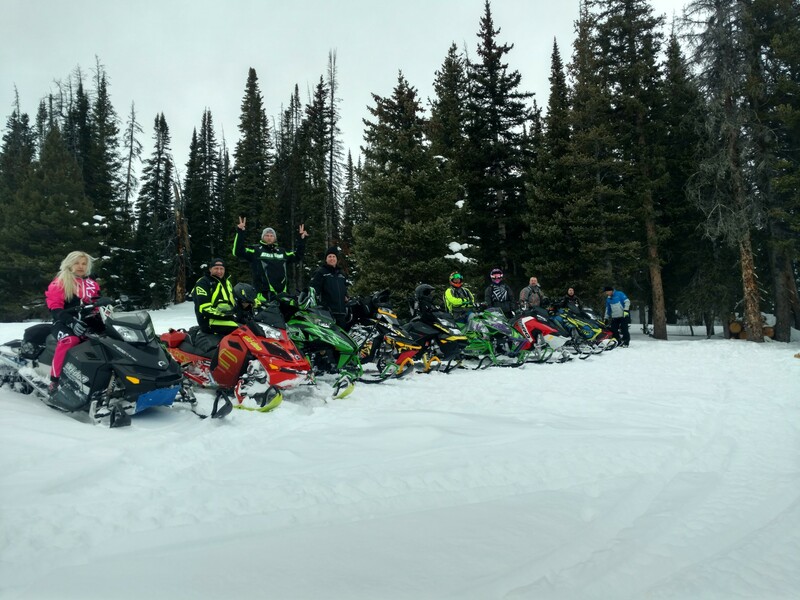 Everyone had a great time, we hope to see another large group on our next ride in Pinedale Wyoming! To keep up to date with us follow us on Facebook! Seven Club member rode out of Greenrock in the snowys. Conditions have improved since the last storm! 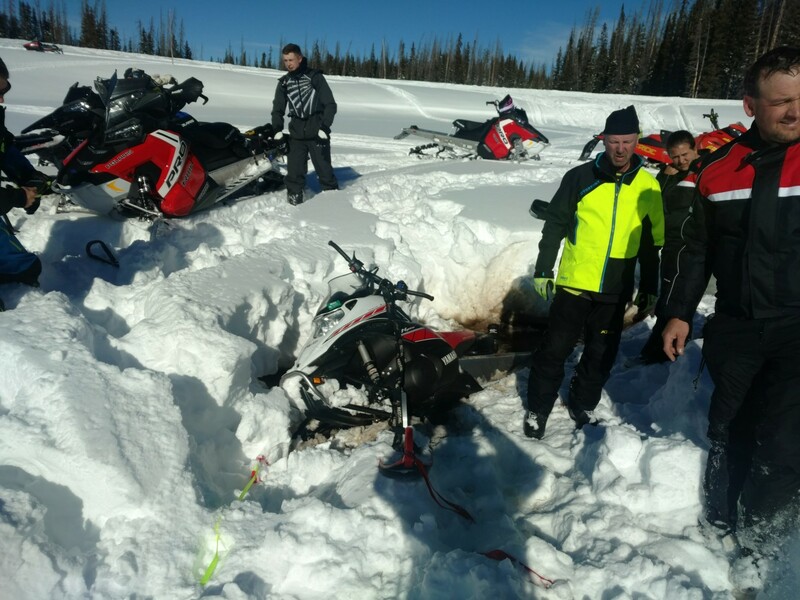 Highway 130 is fully covered, until the junction with N. At the junction of Highway 130 and N we found a crew in a creek bottom that several club members help to dig out! Off trail riding north from 130 and east from N was good. Still land mines out there but good considering the time of year and the lack of regular storms. The rollercoaster is filled in well, the gap is still not crossable. 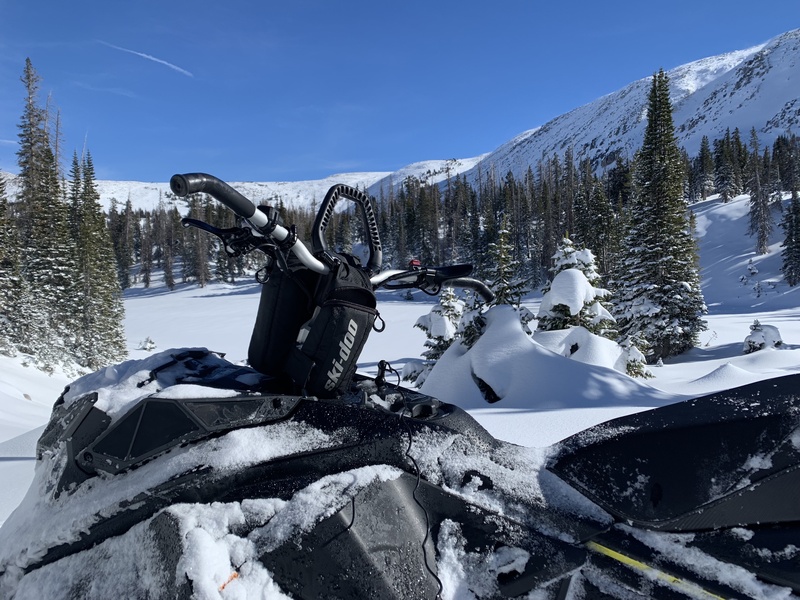 Most lakes are frozen and rideable and some streams are still open. Two more solid storms are needed to make the snowy’s 100% open for riding. If you do choose to ride, go straight to the west face and stay well west of O and north of highway 130. 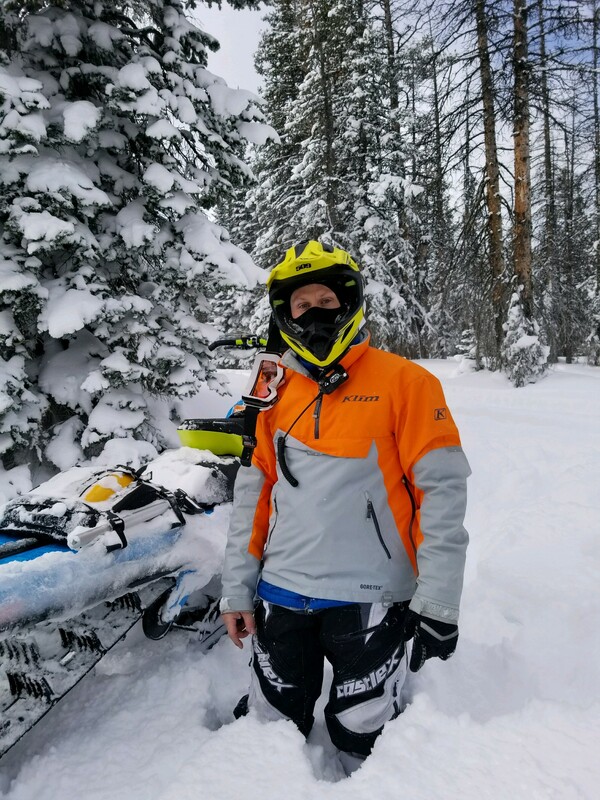 Two club members rode out of Greenrock in the Snowy range on Wednesday 12/6/17 and found conditions have improved after the most recent storm early this week that dropped upwards of 20″ of new snow. The western face has been favored the heavyest. 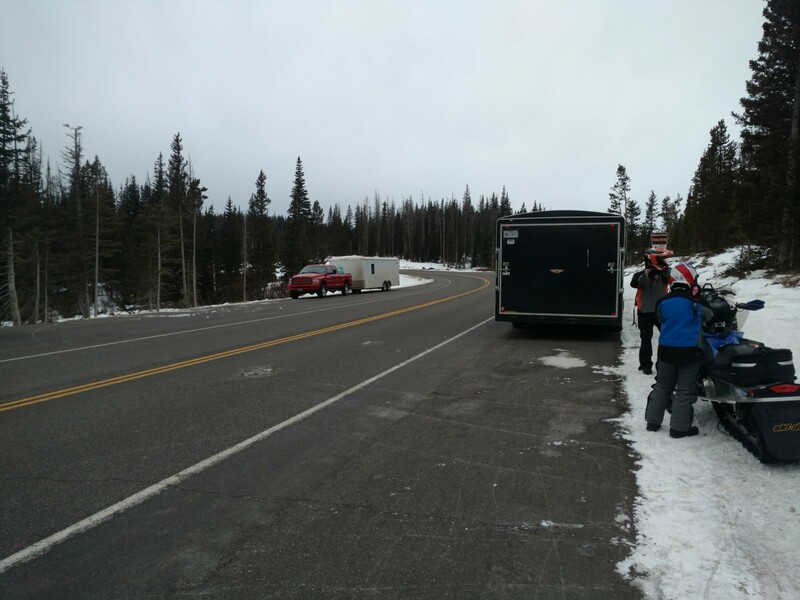 It was found the that highway 130 was mostly covered with some thin/bare spots. Conditions have drastically improved since our last update for this area. 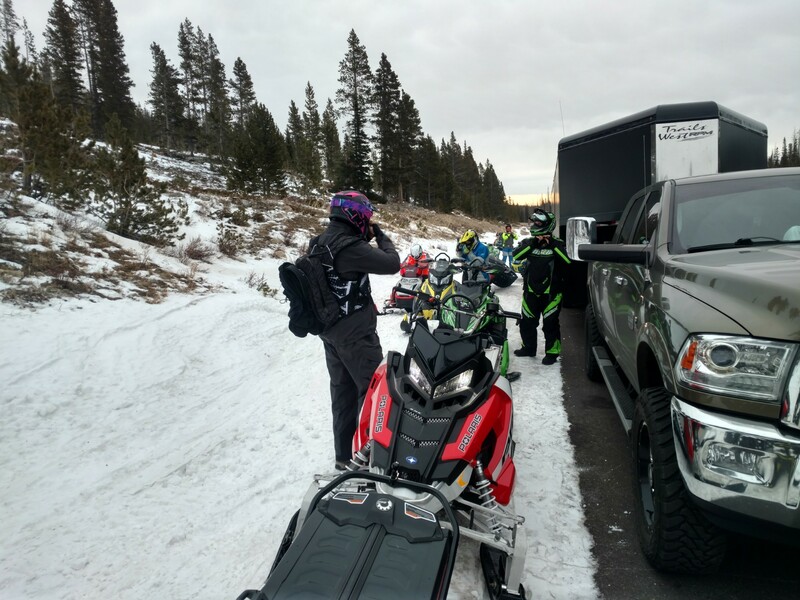 The Colorado Blizzards will be at Sportsmen’s Warehouse in Loveland this week from 10am to 2pm on both Saturday 12/2 and Sunday 12/3 selling raffle tickets for a new 2018 Arctic Cat M8000 snowmobile! 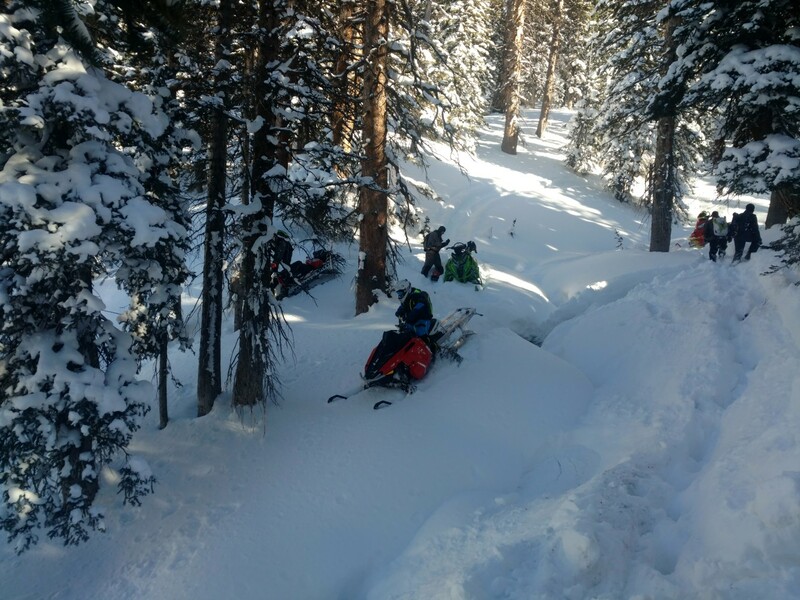 Tickets are $5 apiece and proceeds go to both CSA and Colorado Blizzards to Advance, Promote, and Preserve the sport of snowmobiling in Colorado! Stop by to buy a ticket and support both the Blizzards and CSA! Its that time of year for our annual Presidents Day Ride! As we get closer we will announce details for rides during the weekend. We plan to have multiple groups each day in varying ride levels along with a night ride on Saturday night! If you are not a member and would like to join us on our club ride, send us a message through our Contact Us page or on Facebook! We always enjoy riding with new people! For club members – Details on how to reserve under our block rate will be announced through our club email distribution. We look forward to seeing everyone on the snow! I would like to remind everyone that our standard December meeting not be held on Wednesday 12/13, Our Christmas Party on 12/9 will be held in lieu of the typical club meeting. If you would like more information send us a message! For regular updates, posts and information, also check out our Facebook Page. Join us at the Wild Game in Longmont for Our Christmas Party on 12/9!